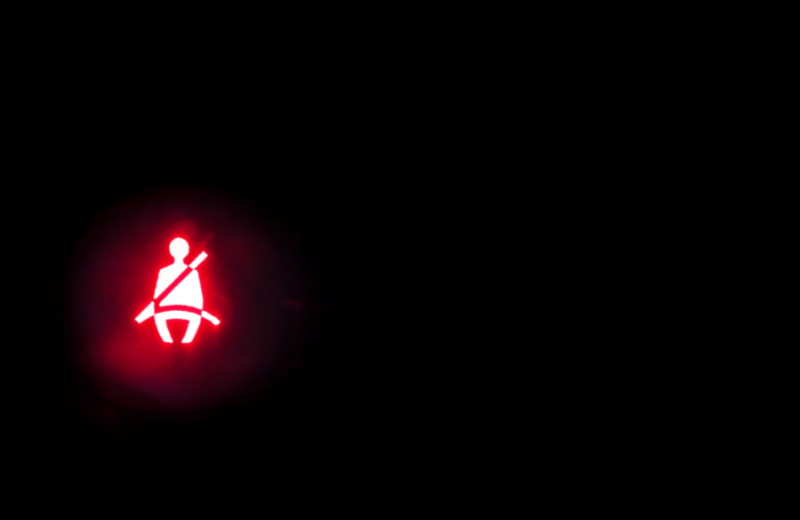 You may be familiar with this scenario – you are driving down the road on your daily commute to work when out of nowhere you see a little yellow light begin glow on your vehicle’s dashboard. Almost instantly you know exactly what’s going on. While you may not feel a difference in your vehicle just yet, you know that something is wrong. Unfortunately, your check engine light has just illuminated and will require repair. The presence of the check engine light on your vehicle typically correlates with the on board diagnostics system (OBD) finding an internal fault or failure in the electrical or mechanical system of the engine. If an issue is found, the vehicle’s onboard computer will first attempt to identify the cause and fix it or the OBD will attempt to fix itself before defaulting to an error. 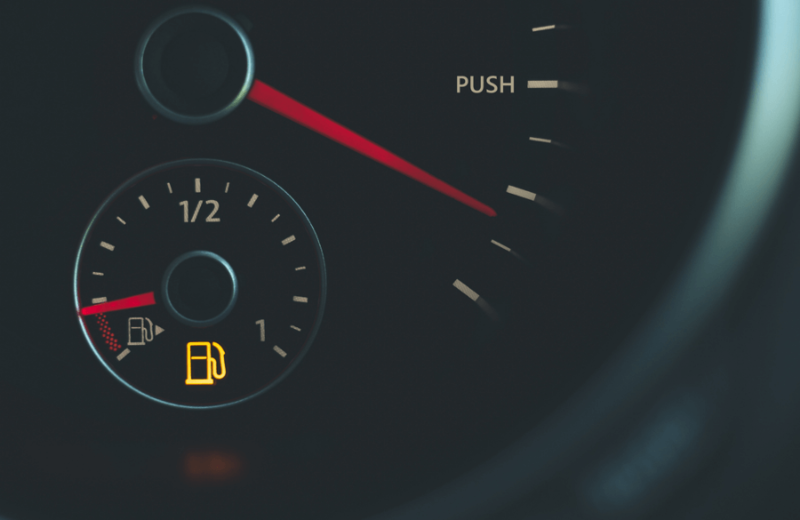 If there is no way for the vehicle to correct the issue itself, a check engine light will illuminate, providing the error code stored in the vehicle’s computer. These error codes, referred to as diagnostic trouble codes (DTC), will then provide an explanation or location of the system error. If your vehicle’s gas cap was loosely attached after filling your vehicle with gas, the check engine light might illuminate. This occurs due to the system reading a potential evaporation leak, or evap leak, and deeming it a system-wide issue. Occasionally, tightening the gas cap may remove the check engine light, while in others it may be required to replace the gas cap completely to remove the error. Unfortunately, as simple of a fix as this seems it is rarely ever the result of a resolving a check engine light alone. It is recommended to replace this component first as part of the overall troubleshooting to ensure this is not the cause of the issue. The oxygen sensor on your vehicle determines the amount of unburned oxygen released through your vehicle’s exhaust system. Depending on the amount of oxygen released, your vehicle may be burning more fuel, which will result in a drop-in fuel efficiency. 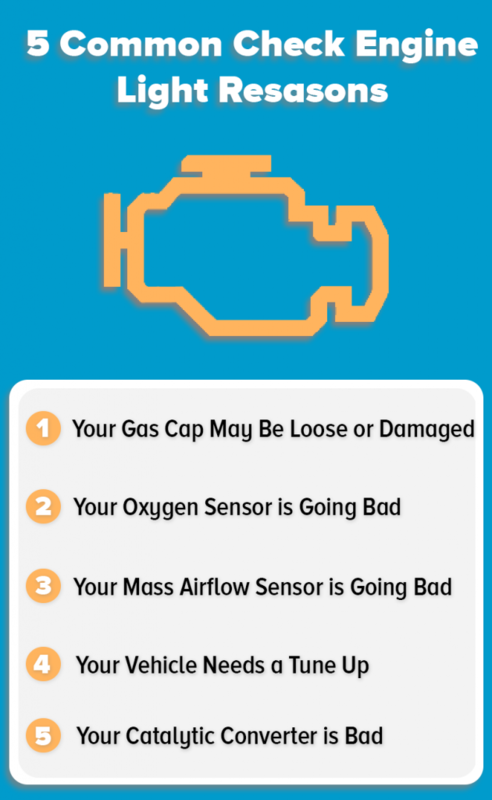 If your oxygen sensor is not replaced in a reasonable amount of time, damage could occur to your catalytic converter, resulting in a large auto repair bill. Luckily, replacing a bad oxygen sensor is not a hard task and could be replaced easily by most individuals with the correct tools. Worried about the large cost associated with repairing your Check Engine Light? Enroll with DriveSmarts Powertrain+ Warranty and Learn how you can save Hundreds on engine repairs! If your vehicle’s mass airflow sensor were to go bad your check engine light may illuminate. This is due to the fuel system not being able to determine the correct amount of fuel provided to the engine, which may result in poor gas mileage or reduced engine power. Difficulty for the engine to turn over or start. Just like the oxygen sensor, the mass airflow sensor is a simple fix that can be done at home. Most of the time, the mass airflow sensor is simply in need of cleaning to remove the check engine light. If you notice your vehicle becoming sluggish or notice your car misfires when accelerating occurring while driving, then it may be time for a tune-up. Typically, these issues occur with the spark plugs or spark plug wires which may result in your check engine light illuminating. In most standard tune-up packages both components come standard, as well as a full inspection of your vehicle, ensuring your vehicle is repaired the first time correctly. It is recommended you take your vehicle to a mechanic to perform a tune-up, as some vehicles will require a car lift to access all areas of the engine. The last common issue that could cause the vehicle’s check engine light to illuminate is a result of the catalytic converter failing. The catalytic converter is required in vehicles to convert the carbon monoxide produced while driving into carbon dioxide. The failure of this component will result in your vehicle failing emission tests. Your vehicle’s performance will also be reduced during operation. Replacing the catalytic converter is one of the more expensive repairs that could be done on a vehicle, as a standard repair could cost anywhere from $300 – $1000 depending on make and model of the vehicle. In some states such as Florida and South Carolina that do not require emissions tests, you may be able to bypass the catalytic converter to avoid the expensive repair costs. This may result in your vehicle’s check engine light remaining on throwing a consistent emissions error. This is one of the most common ways to have your vehicle’s check engine light diagnosed and often one of the most convenient. By bringing your vehicle directly to a mechanic, you will be able to diagnose the issue occurring on your vehicle as well as have it repaired either on the spot or within the following days. If you are close to an AutoZone or other auto parts store, you can request a free OBD scan to be performed by one of the associates. The associate will come out to your vehicle and will diagnose and test the check engine light with the use of their provided OBD reader. This is often recommended before bringing your vehicle to a mechanic, as you will know what issues are happening to your vehicle instead of being at the mercy of your mechanic. This budget-friendly OBD reader provides the ability to scan your vehicle’s error codes and display an explanation of the error directly on the screen. This device also allows you to erase the check engine codes and provides a live “readiness test” to ensure you will pass your next emissions test. This OBD scanner provides you with everything you’ll need to bring your vehicle into the future, at a low budget-friendly price. With simple pairing to both iOS and Android devices, the OBD II Scan tool will provide the user with a live up to date reading of their car’s current status including speedometer, gas consumption, and trip mileage. The scanner also provides results for the check engine light’s error codes, the ability to erase engine fault codes, and provides a “Readiness” test for inspections. Being the least expensive of the options, the KOBRA OBDII Professional Car Scanner provides the user with a basic vehicle test using an easy plug-and-play method. This unit tests solely for check engine light error codes and provides a reading of the code on the onboard LCD screen. This OBD scanner is a perfect unit to keep in a vehicle’s glove compartment without worry of damage or loss. While check engine lights are one of the worst lights a vehicle can display, the repair bill that follows are an aboslute nightmare! That is why coverage for your vehicle is important, especially if your vehicle is older and at a higher risk of breakdowns. Making sure your vehicle is covered with an extended warranty will allow you to keep your vehicle protected as well as relieve the worry of constant breakdowns. Luckily, DriveSmart provides a wide variety of coverage options suited for any make, model or year of vehicle. With DriveSmart’s Powertrain+ coverage plan, vehicles with up to 175,000 miles will be covered in the case of an unexpected breakdown and repair, providing coverage for major components that may result in your check engine light illuminating. All DriveSmart warranties come with included introductory maintenance including fluid replacement, brake and rotor replacements, battery replacements, and oil changes. Ensuring your vehicle is completely up to date with routine maintenance removes the risk of breakdowns in the future. To learn more, visit our coverage page to find out more information about our Powertrain+ warranty.